Polyneuropathy is the simultaneous malfunction of many peripheral nerves throughout the body. Acute polyneuropathy is caused by infections involving a toxin produced by bacteria, drugs including the anticonvulsant phenytoin, cancer such as multiple myeloma, and certain toxins such as thallium. 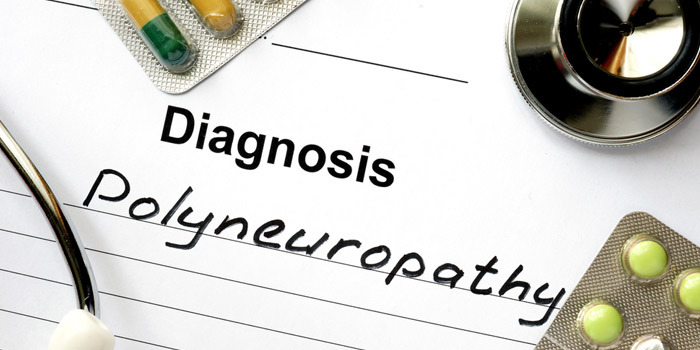 Known causes of chronic polyneuropathy include diabetes, excessive use of alcohol, nutritional deficiencies, vitamin B12 deficiency, toxic substances, kidney failure, and certain cancers such as lung cancer. Acute polyneuropathybegins suddenly in both legs and progresses rapidly upward to the arms. Symptoms include weakness and a pins-and-needles sensation or loss of sensation. The muscles that control breathing may be affected, resulting in respiratory failure. In the most common form of chronic polyneuropathy, only sensation is affected. Usually, the feet are affected first, but sometimes the hands are. A pins-and-needles sensation, numbness, burning pain, and loss of vibration sense and position sense (knowing where the arms and legs are) are prominent symptoms. Because position sense is lost, walking and even standing become unsteady. Consequently, muscles may not be used. Eventually, they may weaken and waste away. Then, muscles may become stiff and permanently shortened (called contractures). Treatments depend on the specific cause. For diabetes, careful control of blood sugar levels may slow progression of the disorder and occasionally relieve symptoms. For cancer, surgically removing the cancer may be necessary to relieve pressure on the nerve. For an underactive thyroid gland, thyroid hormone is given as treatment. For autoimmune disorders treatments include plasma exchange, immune globulin, and drugs that inhibit the immune system.